I’ve written a guide on the differences between investing in TD e-Series funds through a TD Mutual Fund Account and a TD Direct Investment Account. I’ve also written how to buy and rebalance your e-Series funds through the TD Mutual Fund Account. Now let’s look at how to buy TD e-Series Index Funds through TD Direct Investment accounts. 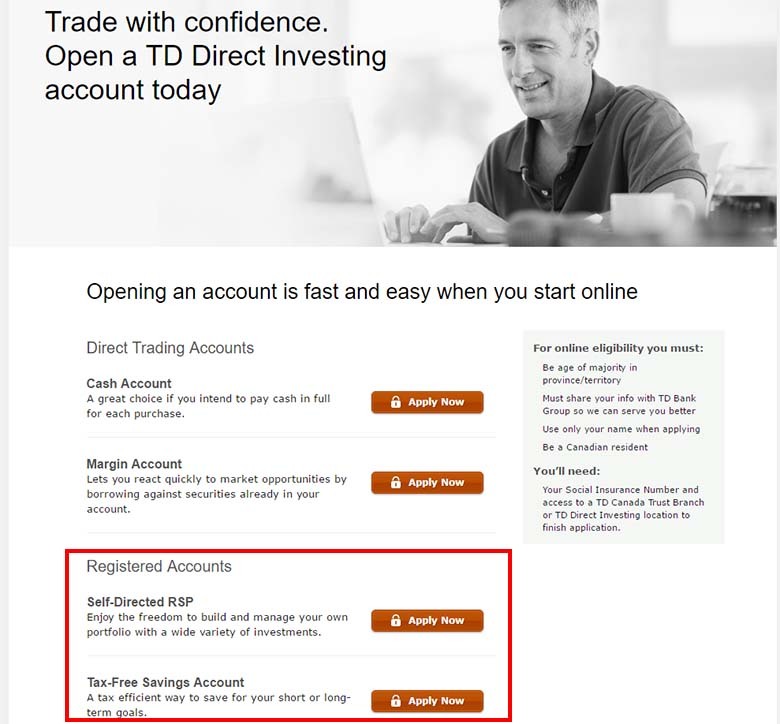 Before you can start trading using TD Direct Investment, you’ll need to setup some accounts. This can be done online or in person by setting up a meeting with a TD Direct Investment rep from your local bank. If you already have a portfolio within a TD Mutual Fund account, see my guide on switching from TD Mutual Fund to TD Direct Investment. I suggest opening a Tax-Free Savings account and/or a Self-Directed RSP account for your investments, which are both available in the TD online application. To access the TD Direct Investment portal, you login to your TD EasyWeb account with your access card code, the same as you would for any of your day-to-day banking. Once logged in, on your main overview page, scroll to your investments section, and click on any of the “WebBroker links. This will take you to the TD Direct Investment portal. Now click on the account that you want to make TD e-Series purchases in. NOTE: You’ll need to have cash funds in that account to make any purchases. Like in a TD Mutual Fund Account, you can Buy, Sell or Switch. If you are buying funds, select the “Buy” option. Allows you to choose to buy in dollars, or in amount of units. I always choose dollars to make sure I know exactly how much I’m buying. You can select to either have your dividends re-invested, or payed out in cash into the same account. I recommend re-investing the dividends – you can always cash them out later. You’ll need to check this box. Don’t let the word commission scare you – there are no commissions when purchasing TD e-Series funds. You’ll need to fill in a Trading password (this option can be turned off in your settings). If you didn’t receive one when you opened the accounts (I didn’t), you’ll have to call into the TD Direct Investment phone line and get them to assign you a temporary one. Select the “Preview Order” button on the bottom right to continue. Make sure to confirm all of your details in this window. 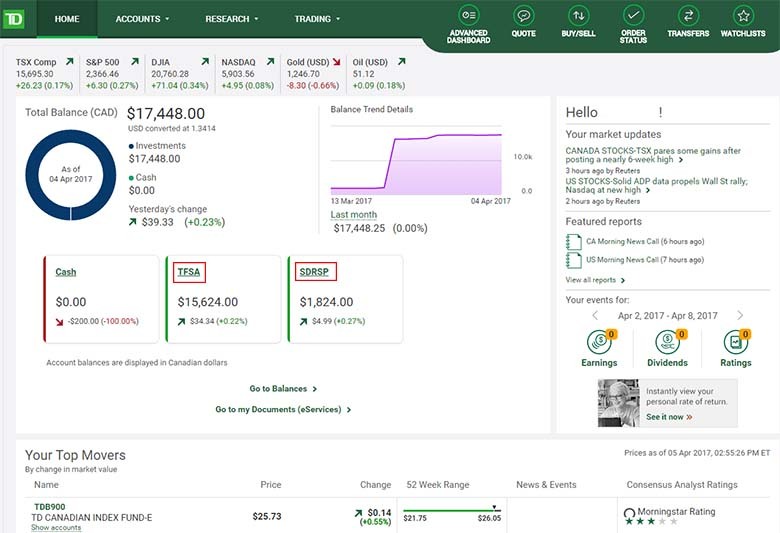 The preview screen also shows that you will be charged $0 for your commission, and provides some additional warnings about minimum holding periods, and long term fees charged by TD Direct Investing – the usual fee’s associated with holding the investment. Select the “Agree & Send Order” button to finalize your purchase. You will now be given a confirmation page that your order was received, with the details and a reference number. Your purchase is now complete. You’re order will be placed at the end of the current trading day, or at the end of the next trading day if the markets are already closed. You can now repeat that process for all of the funds you want to include in your TD e-Series portfolio. A pretty simple process, but it’s always nice to have it laid out step by step with pictures. Was this article helpful? Let me know in the comments below! Okay, this might be a dumb question but I’m a beginner. So when people talk about the % in each mutual fund (like the CCP where it’s 25% in each of the four mutual funds for the aggressive portfolio) does that mean 25% of your cash in each or 25% of the stock amount? Like if you have $100, does it just go $25 in each fund regardless of price? Yep, you’ve got it. 25% of your portfolio worth (it’s cash value) should be in each asset. So if you are starting a new portfolio, and have $100, you would buy $25 of each. That way the cash value of each of your assets is 25% of your portfolio. It doesn’t matter what the price of the assets are, as long as the worth of your investment in that asset is 25% of your portfolio. 1) can I use the TD app to do this? 2) I think there are annual costs associated with having a TD direct investing account… if I go with the e-series instead of buying stocks, can I get out of those banking fees? 1) There is an app that you can access your funds with, and I’m pretty sure you can make trades with as well. The problem is the app only works if you have an associated TD chequing/savings account. For me, I only have a TD Direct Investment account, no chequing/savings, so the app won’t let me log in. I used to be able to use the app when I did all of my banking with TD. 2) There is an annual cost to use TD Direct Investment, but only if your total portfolio is under $15,000. If your portfolio is under $15,000, I suggest using a TD Mutual Fund account to invest in TD e-Series, because a TD MF account is free no matter how much you are investing. That is not correct. The app works even if you only have investment accounts, you do not need a TD bank account. You are correct! Since this comment was posted, TD released a major overhaul of their app, which now includes a pretty comprehensive section on investments. Can I set up a monthly ppp that will buy the same percentage of funds? For example if I buy funds similar to the Canadian Couch Potato portfolio, 40% bonds, 20% can equity, 20% us equity, 20% intl equity, can I set up automatic monthly purchases at the same amounts or %’s every month? 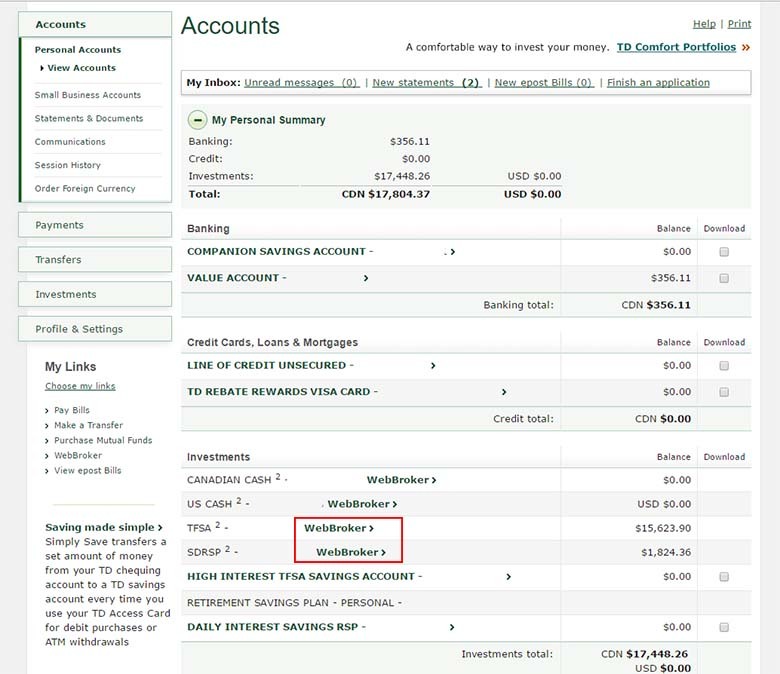 There is a way to set pre-authorized deposits to deposit cash from a chequing account that you have, into a TD Direct Investment account as Cash (using a form found here: https://www.td.com/ca/products-services/investing/td-direct-investing/accounts/forms-applications/index-res.jsp), but in my research, I’ve haven’t found a way to setup pre-authorized purchases of certain funds once that cash is in your TD Direct Investment account. Unfortunately you may have to talk to a bank representative to find out if there is a way to set it up outside of the website. It would be possible to do if you were investing through a regular TD EasyWeb Mutual Fund account, with the Pre-Authorized Purchase Plans option. To do it based on percentages would be fairly easy, by just dividing the total amount that you want to buy each month by your percentages, and setup pre-authorized purchases for each of those amounts. For example, if you were setting aside $1000 a month to be invested in your portfolio, based on your example percentages, you would setup a pre-authorized purchase plan for $400 bonds, $200 us equity, $200 canadian equity, and $200 intl equity. You would still need to revisit your portfolio maybe once a year to do a total rebalancing of your whole portfolio. However, I believe he’d do even better with the Tangerine Balanced Growth Portfolio at 1.07%. You don’t add up the MERs. If anything you would do a weighted average MER. The American accounts are for if you want to purchase and hold assets with American dollars. You can puchase all of your TD e-Series funds (Canadian, US, and International) through your Canadian TFSA and RRSP. Not quite sure why you were setup with american accounts as well, but I guess some people may prefer to deal with American cash instead of Canadian cash. Hey, something I think you should note to your readers, when you set up a pre-authorized deposit of say, $200, to your TDDI account in cash from another financial institution, note that you cannot purchase any td e-series amount less than $100. So say if you wanted to split your $200 into a 30/30/30/10 split, you cannot do so since 30% of $200 is $60 which is less than the required purchase amount for any of the e-series funds. This was something I learned when I was starting out. I’ll be so glad if you know of a workaround to this! But with TD DI, I won’t be able to buy any of those amounts. Usually what I do is first look at my current re-balancing needs for my portfolio, if certain funds are lagging behind, I’ll focus on those. But overall, I’ll pick 3 to buy, a buy the minimum ($100) of those. Next month when I’m purchasing more funds, I’ll make sure to purchase from the fund that I skipped in the previous month. Your target percentages don’t have to be exact, they are just a general guide to help you determine where to put your money within your portfolio. If you re-balance once or twice a year, you’ll be able to make up for any target percentage inequalities anyways. Which of the TD eseries fund are good to purchase as of now? Is it advisable to buy ETF’s too? The general idea of the couch potato e-Series portfolio is that the funds you purchase are long-term holds, and therefore the strategy of which ones to buy doesn’t change over time or depending on how the market is doing. So by that strategy, I stick to only buying the 4 funds that I originally started with (Canadian index, US index, International index, Canadian Bonds index) as they cover the global market with additional focus on domestic. There are Japanese and European e-Series index funds you could add to your portfolio as well, but that may overly diversify it. If ETF’s are more your thing, I would suggest picking 1 route over the other (ETF’s or TD e-Series). Essentially they are different ways of doing the same thing – investing in low MER global market indexes. But I wouldn’t buy both myself. Hello! I am a newbie in DIY investing. Just trying to be financially educated and responsible. I just recently opened a TD Direct Investing from a TD branch! The advisor I was talking to was a bit younger and also has this account which helped. He was able to open one for me no problem. I just have to wait for the online login now, so opening the account probably will take a week. At first I want to open a mutual fund and will convert it to online but he doesn’t know why anyone would do this. Now I know it’s probably because of the fees/limit. Reading from the comments, it seems like I have to buy $100 worth of index funds at a time. The financial advisor did try to explain how purchasing ETFs have $10 fee each transaction, etc. and $25 quarterly fee (can be waived). I kept telling him I plan to purchase index funds which he seemed to not understand. I think he personally does stock/ETF buying on his own. Of course he explained the pros and cons of DIYs vs mutual fund from them (actively managed = better returns as someone watches the market and doesn’t want losses and the fee is worth it vs DIY = you have to do everything, could have consequences compared to a professional handling the investment etc). The advisor opened a TFSA webBroker which does not have any funds this time. I currently have a regular TFSA with TD which I believe they can transfer for me to avoid messing up the contribution limit. My question is, should I open other accounts such as Canadian Cash and have funds there to be able to purchase index funds if I set-up the pre-authorized payment plan? I am trying to follow the step by step guide with screen captures which is really helpful! I also plan to purchase RRSPs as well in the future but starting with investing in TFSA now. If I decide to do so, will I receive the contribution receipt in the mail for RRSP for tax filing? Can my mutual fund RRSP in the bank TD be transferred to the e-series? And can this be done through the branch or call the customer service from TD Direct Investing? Thank you in advance! Congrats on getting into DIY investing. You’ve got quite a few points here, so I’ll see if I can get to all of them. You could open a Canadian Cash account if you like, I have one as well, but I have never used it. If you are focusing on your TFSA, you can set your pre-authorzied payments to go right into your TFSA, bypassing the Canadian Cash account altogether. I think they just opened a Canadian Cash account for me by default. I also plan to purchase RRSPs as well in the future but starting with investing in TFSA now. If I decide to do so, will I receive the contribution receipt in the mail for RRSP for tax filing? Yes, you’ll get a mailed RRSP receipt for tax purposes that covers what you’ve contributed throughout the tax year. Can my mutual fund RRSP in the bank TD be transferred to the e-series? If you have TD e-Series in a RRSP TD Mutual Fund account, you can request the bank to transfer the holding in-kind (directly) to your TD Direct Investment RRSP account, avoiding any withdrawal complications. And can this be done through the branch or call the customer service from TD Direct Investing? An in-person TD Direct Investment rep can help you fill out the paperwork to directly transfer funds. I’ve never tried doing this over the phone, but since signatures are required on forms, they may also direct you to an in-person rep.
Hi there. Love the blog here mate. Have a question – do you know is it possible to do two things. 2.) is it possible to make random one-off investments in to this from another bank? just like paying a bill or something? Yes on both accounts! You can setup automatic contributions to your TD Direct Investing account through another bank, but you’ll need to fill out some physical paperwork at a local TD bank to do so. And I believe that these automatic contributions would go into your specified account as Cash, so you would still have to login and buy the appropriate TD e-Series funds once the cash showed up. And random one-off investments are my primary method of funding my investments. You’re right, it is just like paying a bill. I’ve setup a bill payment through my primary bank (Tangerine) to go as a bill to either my TFSA account, my RRSP account or my cash account within TD Direct Investing. Takes a day or 2 to go through, but works perfectly. At the end of the month, I take my extra cash and make a bill payment to my TD Direct Investing account, and when the cash shows up, I make my purchases, sticking to my target fund allocation. actually its even easier to make payments from another financial institution into your TD brokerage account. I then requested auto-purchases of the e-series funds from my rep (I wasn’t able to find out how to do this through the TD app) so you’ll likely have to visit TD either way. I just like having control of the payments from my regular banking institution and can change them easily online so I don’t have to worry about not having enough in the account etc. Glad I could be helpful, good luck with your investing! Hmmm is there no way to go straight from Comfort series Mutual Funds to the e-series? How do I get the total balance of my TFSA in the Comfort series to ‘cash’ to the e-series without messing up my contribution limit? You can use the “switch” option within TD Direct Investing. When you select the “sell” option for a mutual fund, it gives the option to “switch” instead, which skips the middle step of moving to cash. Also, even if you sell your Comfort series to cash within your TFSA, it won’t affect your contribution limit, as you have a cash fund within your TFSA. This is assuming that you’re using TD Direct Investing and not a TD Mutual Fund account within TD EasyWeb. hi, i recently (a couple of weeks ago) moved my TFSA savings from a financial planning account to a direct investing account. i want to sell everything and invest in the couch potato model. when i tried my first sale, i got this warning: “Funds held for less than 30 days are subject to a TDW short-term redemption fee of 1% or $45, whichever is greater.” given that i just moved these over less than 30 days ago, am i subject to this fee? What funds are your assets currently in, and what were they in before you transferred over from your financial planning account? Were they the same asset? I had this same thing happen to me. I called TD and let them know that I was told there would be no fees, and that the branch was supposed to have moved these funds over to cash for me, so that I didn’t feel it was fair to be charged a fee to DIY something that was missed in setting up my DI account. Hope it gets resolved for you! they were/are mutual funds; i had them moved over in kind. This is probably something you would have to check in with a TD DI rep to confirm. Off the top of my head, I would guess that moving funds in-kind does not count as a new purchase, but I can’t be sure about that. If you’ve already waited 2 or 3 weeks, you may just want to wait another week or 2 to be sure that you won’t be charged a short-term redemption fee, or confirm with your bank rep. If you find out an answer, let us know what it is!